For spills on concrete or bitumen surfaces, use polypropylene absorbents or any of the ground and floorsweep products. Oil and fuel spills that have soaked into soils are more difficult to absorb than if they were on a sealed surface. If free liquid exists, use polypropylene absorbents (e.g. 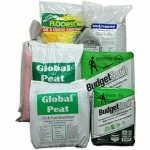 pad or pillow) to soak up the puddles and apply a bioactive ground absorbent (eg Global Peat) to the remaining spill.